Your awards dinner, anniversary gala or other high end event deserves an ad journal that lives up to the occasion. 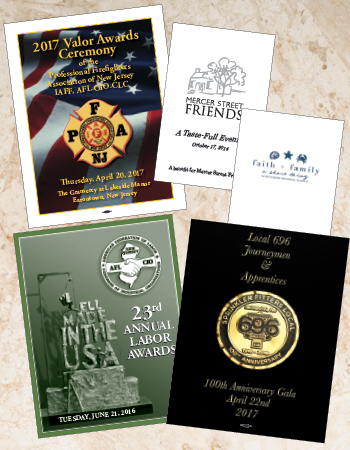 Trenton Printing is well known for producing books that make our clients proud and their advertisers happy. We know how to transform that mound of paperwork and inbox full of files into an attractive, effective keepsake that will be treasured for years to come. Want to take your event to the next level? Make it extra special with signage or a commemorative promotional product or two. "Everything was delivered, the journals are fantastic! Thank you again for all of your help with this, you truly made a monumental task much easier."